Made by I.T.S. Rubber Ltd in Hampshire, England, c1936. Minibrix are interlocking rectangular rubber bricks similar to Lego. The bricks have studs on the underside and holes on top. Most of the bricks are red and some are white, while the roofs comprise whole sheets of green rubber which are hinged in the middle. Windows and doors, which come in house and church styles, are printed onto thin sheets of celluloid and fit with 'pips' into the bricks. Bricks and beams with holes on both sides provide the foundation layer and form lintels. Building ornament is provided with white 'balustrade' pieces. The scale of the Minibrix buildings is ½ an inch to 1 foot (1:48), which fits in well with the 0-gauge model railway layouts popular at the time for which these buildings may have formed a landscape. 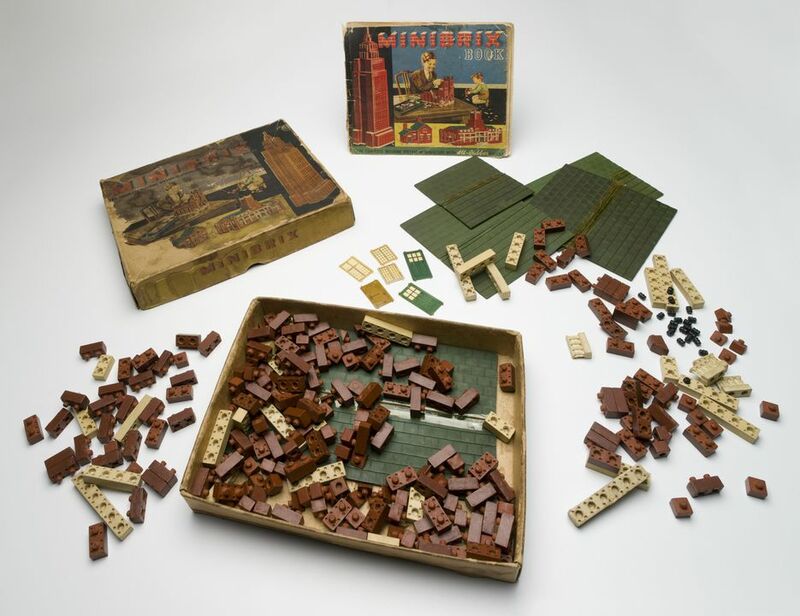 The Minibrix comes in its original cardboard box with lid, which is labelled and illustrated in colour with the wording 'Minibrix the complete building system in miniature with all-rubber bricks'. The box contains approximately 150 bricks including various sizes and lintels, 5 green roofs and an old cigarette tin of the 1950s which contains 20 universal pins; and 1 church door, 2 house doors, 2 small windows and 1 large window in celluloid. The box also contains a full colour 48-page (pre-War) manual (190mm x 230 mm) that depicts the same coloured cover as the box lid. It would seem a number of bricks and universal pins have been lost over the years. It is thought that this set was originally a No.4 set. At the time of manufacture, this set would have comprised 433 pieces which, according to the manual, would have consisted of 200 whole bricks, 78 half bricks, 48 angle bricks, 14 x 1 inch lintels, 24 x 2 inch lintels, 13 x 3 inch lintels, 4 balustrades, 36 universal pins, 2 house doors, 2 church doors, 4 small windows, 4 large windows, 1 x roof No.1, 1 x roof No.2, 1 x roof No.3 and a Minibrix book. Box lid: 'Minibrix The Complete Building System in Miniature with All-Rubber Bricks / Printed in England'. Inside right hand side of box: 'British Patent No.413380 / E.S.& A. Robinson Ltd, Bristol'. Minibrix construction bricks were made by the Premo Rubber Co Ltd of Petersfield, Hampshire, England, between 1935 and 1976. Premo was a subsidiary of I.T.S. Rubber Ltd, which had been founded in 1919 by Arnold Levy, and was located at Sandringham Road, Petersfield. Arnold Levy went into the leather and grindery trade, as a wholesale supplier to the shoe repair industry. His business took him to the United States of America where he learnt about a revolutionary new style of rubber shoe heel and the Petersfield factory was initially established to manufacture the heel under licence. At its peak, the factory employed 250 workers and was the largest employer in the town. The company prospered and decided to diversify with the shoe supply side conducted under the name 'Itshide' while Premo was used as the trade name for a further range of rubber goods including bath brushes, complexion brushes, rubber bath mats and various medical items. The origin of the Minibrix idea is unclear but Arnold may have seen the fibre-interlocking toy bricks of the early 1930s introduced by the Erector Company in America and the rubber interlocking bricks, called 'Bild-O-Brik made in Pennsylvania, in 1934. The Minibrix system consisted of small red rubber bricks, 1 in x ½ in ? in, (25mm x 12.5 mm x 9mm) which had two lugs or "pips", protruding from the bottom which connected to the brick below which had two holes in the top. The construction method, later reinterpreted in plastic, came to dominate construction toys to the present day. Initially eight sets were available, numbered 0 (Junior Set) to 7 ranging from 147 to 1,376 parts to build from 54 to 116 models. The sets were launched in 1935 and contained whole bricks, half bricks, angle bricks, lintels, and thin plastic windows and doors and roofs made of cardboard. A series of four accessory outfits was also available to build up to the larger sets and an instruction manual contained photographs of the models together with a set of architectural-style 'blueprints' with plans and elevations. These models were advertised as having been designed with the aid of a 'well known' architect, W.A.T. Carter A.R.I.B.A. At the end of the catalogue photographs of 'supermodels' depicted Hampton Court, Tower Bridge and a skyscraper modelled on the Empire State Building measuring nearly 4 feet (1.2 metres) in height. There were no instructions for these but could be obtained from a toy dealer who also kept a range of spare parts for separate sale. By this time the factory was also making models for shops and exhibition displays. The range of parts increased in 1936 and the sets were revised with new parts added including balustrades, Corinthian pillars, double-angle bricks and universal pins in the larger sets. The roofs were changed from cardboard to rubber sheets and rubber base plates could be purchased on which to build the models. The blueprints were discontinued in favour of a new colour instruction manual. Minibrix was a very labour-intensive to make. Each rubber brick was moulded individually and emerged from the moulds with a ring of waste rubber around the top and bottom of each brick. This was removed by hand in the trimming shop, a process which required eight separate scissor cuts. After about 1959, and under new management, a new process was introduced which saw several bricks moulded at once in a pad which was then cut into separate bricks afterwards. Unfortunately, the bricks were no longer identical and when walls were built they did not fit as precisely as before. In common with many construction toys such as Meccano and Airfix, a club called Minibuilders' was established to encourage modellers. An application form was provided with every set and members received a badge, certificate, special Minibrix pencil and newsletter, the 'Minibuilders' Bulletin'. A prize was offered for any model design sent in that was later published in a manual. During the Second World War production of Minibrix ceased between 1942 and 1947 as the factory went over to making rubber tank treads and other items with a military application. One of the post-War consequences was an increase in the price of Minibrix sets due to the sharp rise in the cost of rubber. Nevertheless, post-War sales of Minibrix increased with the economic climate and birth of the baby boomers. But the firm became complacent, especially after the death in March 1955 of Arnold Levy, and he was succeeded by his brother, Moss, as managing director. In 1959 the Levy family's controlling was bought by Colstons Ltd. Cost-cutting measures saw the production methods of Minibrix change, the Tudor Minibrix were dropped from the range altogether, and the base plates, individual roof tiles and purlins removed from sets. The Corinthian columns were replaced by much longer plastic versions called 'supporting poles', the doors and windows were redesigned to bring them more up-to-date and a large picture window was added, together with a set of garage doors to acknowledge the increased popularity of the family car. By this time the sets were revised and reduced in number to just four: Starter, Premier, Super and De Luxe, the latter of which was only the size of the old 433-piece No.4 set. There were three accessory sets, Nos 0, 1 and 2, which upgraded the four sets. The sets were packaged in cardboard mailing tubes, rather than a box and the manual was reduced to 14 pages. By the 1960s competition from plastic building toys, especially from Lego, was intense so in a final desperate attempt to update, a series of accessories including plastic trees, flowers, window boxes, hanging lamps, a sundial and balconies with canopies were introduced. These were not made by the firm but were sold in a new range of 22 Minibrix Extra sets. The last Minibrix sets were introduced in the late 1960s, Nos 1, 2 and 3, and came in red or rainbow versions. Production faded in the early 1970s and had ceased altogether by 1976. This box of Minibrix was purchased in Sydney by the donor's parents for her brother, Lindsay Barton Brown, born in 1928, who played with it while ill with rheumatic fever. It was subsequently used by the donor's children. It was thought to have been purchased from the Sydney toy and model shop Walther & Stevenson Pty Ltd of 395 George Street. Apparently when the bricks were new they were a tight fit and some force was required to assemble them. Over time the bricks go hard and the interlocking studs erode to a 'drop-in' fit. One complaint was that there were never enough windows in the sets. The colours and textures of the bricks were more realistic for domestic architecture and public buildings than the later, gaudy, primary colours of Lego. The buildings themselves had a distinctly British appearance while the rubbery smell was both memorable and exotic. Minibrix was promoted as being 'hygienic' being made of rubber and therefore washable. What the manufacturers did not realise is that children licked the studded surface to make better adhesion! It was also noted that the brick would neither "break nor chip" and importantly to houseproud mothers "cannot damage furniture".